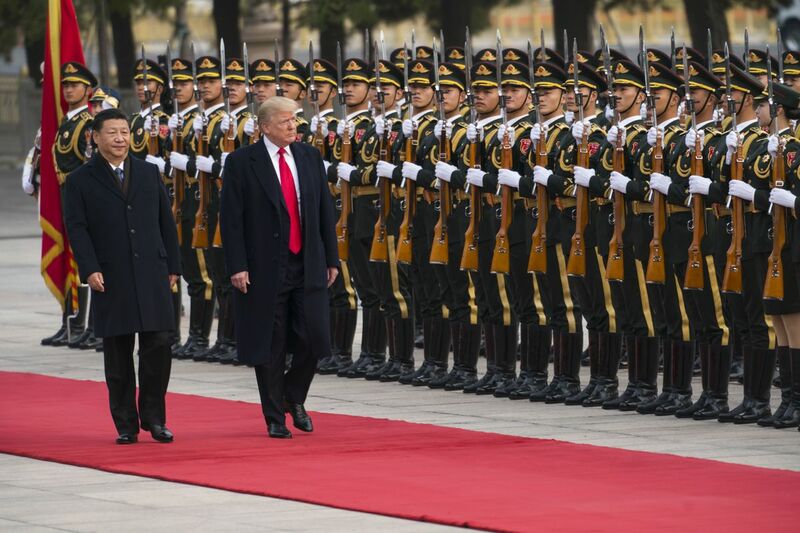 WASHINGTON — China has been a tricky economic partner for the United States, offering both lucrative opportunities for collaboration and a minefield of security risks. That tension was on display this week as President Donald Trump arrived in Beijing with a coalition of American industry leaders who plan to announce new deals with Chinese companies. At the same time, a group of bipartisan lawmakers in Washington introduced legislation Wednesday that would subject Chinese investments to greater scrutiny through a significant expansion of the Committee on Foreign Investment in the United States, or CFIUS, a panel that reviews foreign mergers and acquisitions for potential threats to national security. The dual approach highlights the challenge facing the Trump administration as it tries to articulate a clear strategy for dealing with China. Trump campaigned on a get-tough approach to China — a view that is shared by many Republican and Democratic lawmakers who see the country as a growing threat — but he must now balance that position with preserving the business ties that much of the U.S. economy depends on. On Wednesday, Sen. John Cornyn, R-Texas, and Sen. Dianne Feinstein, D-Calif., introduced legislation that could add thousands of companies with foreign ties to the list of those reviewed each year by CFIUS and provide more funding to deal with that increase. A similar House bill was also introduced Wednesday by Rep. Robert Pittenger, R-N.C. The legislation is aimed at preventing China from taking advantage of the United States' open approach to foreign investment to access sensitive technology. Policymakers and lawmakers in the United States have grown increasingly skeptical of China's investments in advanced technology industries like robotics, self-driving vehicles and artificial intelligence. Beijing has explicitly laid out a strategy for its companies, called Made in China 2025, of acquiring foreign technologies to build homegrown giants. Chinese investment in the United States and elsewhere has surged in recent years as the Chinese government encouraged companies to acquire technology and know-how abroad, and as Chinese companies and wealthy individuals sought safer refuges for their money. In the United States, Chinese investment tripled from the previous year to reach $46 billion in 2016, according to the Rhodium Group, a research firm. This year, tighter Chinese controls on outbound capital appear to have cut that figure sharply. As a result, U.S. officials have called for raising their scrutiny of foreign deals through the CFIUS process. The reviews have expanded beyond the defense industry to focus on a wider variety of perceived security threats, including the acquisition of cutting-edge technology. Purchases of companies with sensitive information, like financial data or health records, have been turned down because of a perceived threat of espionage or blackmail. In September, Trump blocked a Chinese-backed investor from purchasing a U.S. semiconductor company after CFIUS recommended rejecting it based on national security concerns. It was only the fourth such deal to be blocked in the nearly three decades since such reviews began. CFIUS also stopped a deal in July that would have given a Chinese company with ties to top leaders access to airplane Wi-Fi networks. It is reviewing the proposed sale of MoneyGram, a payments company, to Ant Financial, an affiliate of Chinese technology giant Alibaba Group. "They are looking at a lot more deals than they have traditionally, and a lot more politically sensitive deals," said Thad McBride, the chairman of the international trade group at the law firm Bass, Berry and Sims. That would only increase under the legislation introduced Wednesday, which would expand reviews from focusing strictly on mergers and acquisitions to include joint ventures. Lawmakers said some Chinese companies have been bypassing the CFIUS review by forming joint ventures with U.S. companies or licensing their technology. The legislation would seek to close that loophole by requiring an automatic review of joint ventures that exceeded a certain threshold of foreign ownership and expand scrutiny of certain emerging technologies that could give countries like China an edge over the United States. "This bill takes a measured approach by providing long overdue reforms to better protect our country, while also working to ensure that beneficial foreign investment is not chilled," Cornyn said. China has already objected to reviews of its acquisitions, describing them as protectionism in disguise. Chinese companies have tried to highlight how their investments create jobs and support economic growth in the United States, and thus dovetail with the president's goals — including the administration's primary rationale for tax reform. Treasury Secretary Steven Mnuchin, the chairman of the multiagency CFIUS panel, said last month that the Trump administration was "working very proactively with the House and the Senate on areas where we think there could be legislative improvements." "I would expect there will be a lot of bipartisan support for that," Mnuchin added. He said there was a clear need for reform that would prevent companies from doing "things indirectly that they're not allowed to do directly." In the United States, companies are freely allowed to sell their assets to the highest bidder, unless the acquisition could pose a security threat. But some proposals to reform the CFIUS process have called for expanding that criterion as well. Sen. Chuck Schumer of New York, the Democratic leader, proposed a plan in August that would have created an additional review mechanism to consider whether investments, mergers and acquisitions were economically harmful to the United States, either by costing jobs or the loss of technology to competitors. Lawyers and investment bankers say the shadow of CFIUS is looming larger than ever over corporate transactions. In Singapore, for example, officials with the government's sovereign wealth fund, Temasek, say they perceive CFIUS as increasingly looking at deals through the lens of what their long-term effect could be on the U.S. economy and companies, rather than through a strictly national security prism. But the review process is especially daunting for Chinese companies. Ya-Qin Zhang, the president of Baidu, the giant Chinese internet company, said at a Silicon Valley dealmaking conference in October that his company was looking to do more deals in the United States but "has to be careful" because of CFIUS and the political climate. "The scrutiny that CFIUS and Congress is now having on Chinese deals" is probably at its highest level ever, Jerry Yang, the Yahoo co-founder, said at the Silicon Valley conference in October. Yang described the process of government authorities in the United States and China reviewing deals as "the invisible hand of the government — or maybe it isn't so invisible," he said. David Enrich and Alan Rappeport contributed reporting.